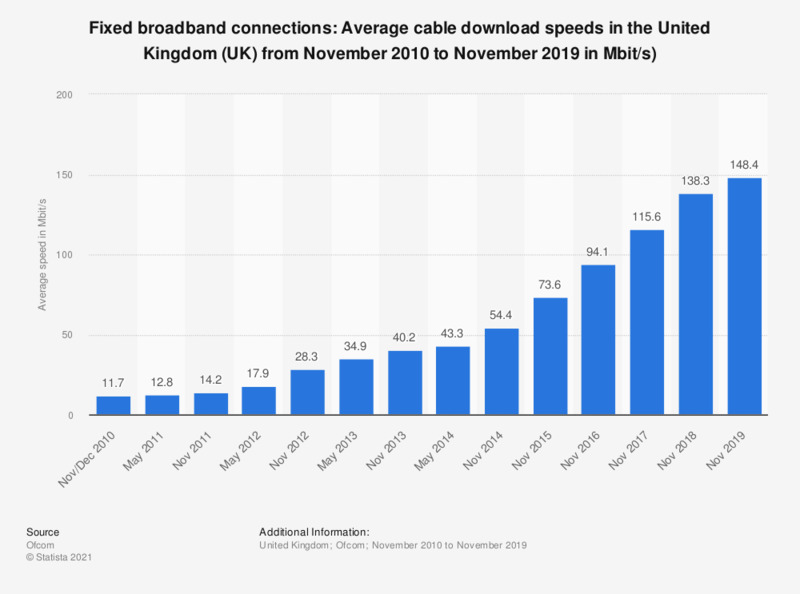 The statistic shows the average cable download speeds for fixed broadband connections in the United Kingdom (UK) from November 2010 to November 2017. In November 2016, the average cable download speed reached 94.1 Mbit/s in the United Kingdom. This average download speed increased and reached 115.6 Mbit/s in November 2017. This type of internet is delivered by the use of a cable modem, and it is used primarily to deliver broadband internet connection in the form of cable internet. These download speeds were relatively the highest when compared to other broadband connection speeds, such as the ADSL download speeds.